“GE” (General Effect) is perhaps the most important caption in indoor percussion and the least understood. It is NOT simply an audience applause meter; it is NOT simply a gauge of “likeability”; it is NOT simply the judge’s “favorite” show. GE in WGI Percussion has two sub-captions. MUSIC EFFECT considers communication, musicianship, creativity, blend, virtuosity (“excellence as it relates to effect”) and expression. OVERALL EFFECT includes drill, acting, costuming, narration and props. This sub-caption considers communication, audiovisual coordination, creativity, pacing, impact/resolution, effects and entertainment. 1. Do your own thing—don’t imitate last year’s winner. 2. Think “audience” when you make program choices. 4. Make an impression in the first 30 to 45 seconds. 5. Be obvious. Shows that are effective have an intent that is immediately clear and appealing. Groups that win often have an intriguing sub-layer. 6. Play with quality. Groups that are effective but sloppy will not score as well as those that are clean musically. 7. Never accept a neutral reaction. Go for it! Entertain! 8. Remember “communication” is the first consideration under both sub-captions. 9. Be creative without being overdone. Do not feel compelled to write bass drum features, flam-drags at 168, split-rolls on tenors, six mallet parts or five cymbal parts. Less is more. 10. Most of all, have fun. Dennis DeLucia is one of the most highly respected percussion teachers, arrangers, clinicians and judges in the United States. 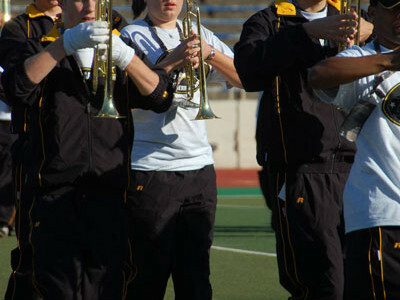 A former member of the West Point Band, he is best known for his successes with championship drum corps and bands. He helped architect the scoring system for WGI’s indoor percussion. Results of the Drum Corps Associates World Championship in 2009, from Halftime Magazine, a print publication and online community about the marching arts.